NuGet 1.7 was released on April 4, 2012. If you are running VS 2010 SP1, you might run into an installation error when attempting to upgrade NuGet if you have an older version installed. The workaround is to simply uninstall NuGet and then install it from the VS Extension Gallery. See http://support.microsoft.com/kb/2581019 for more information. Note: If Visual Studio won't allow you to uninstall the extension (the Uninstall button is disabled), then you likely need to restart Visual Studio using "Run as Administrator." New in 1.7, if your package includes a readme.txt file at the root of the package, NuGet will automatically open this file after it's finished installing your package. The Manage NuGet Packages dialog now includes a dropdown which provides option to show prerelease packages. When you open the Package Manager console or the Manager NuGet packages dialog, NuGet will check if the current solution has enabled the Package Restore mode and if any package files are missing from the packages folder. If these two conditions are met, NuGet will notify you and will show a convenient Restore button. Clicking this button will trigger NuGet to restore all the missing packages. In previous versions of NuGet, each project has a packages.config file which keeps track of what NuGet packages are installed in that project. However, there was no similar file at the solution level to keep track of solution-level packages. As a result, there was no way to restore solution-level packages. This feature is now implemented in NuGet 1.7. The solution-level packages.config file is placed under the .nuget folder under solution root and will store only solution-level packages. Due to low usage, the New-Package command has been removed. 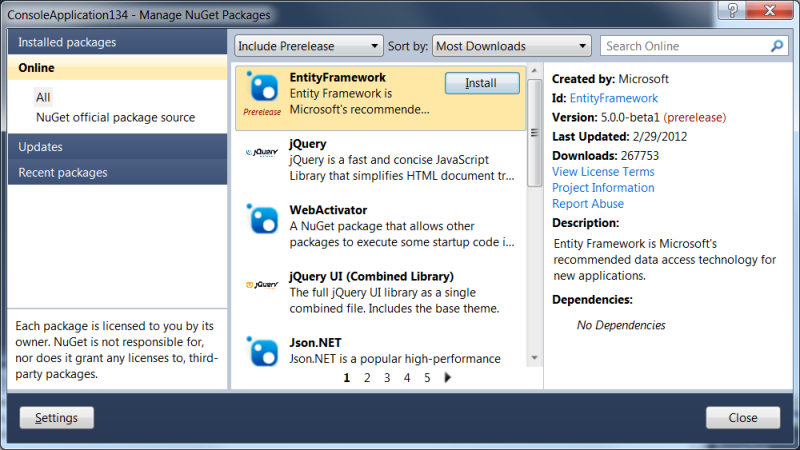 Developers are recommended to use nuget.exe or the handy NuGet Package Explorer to create packages. 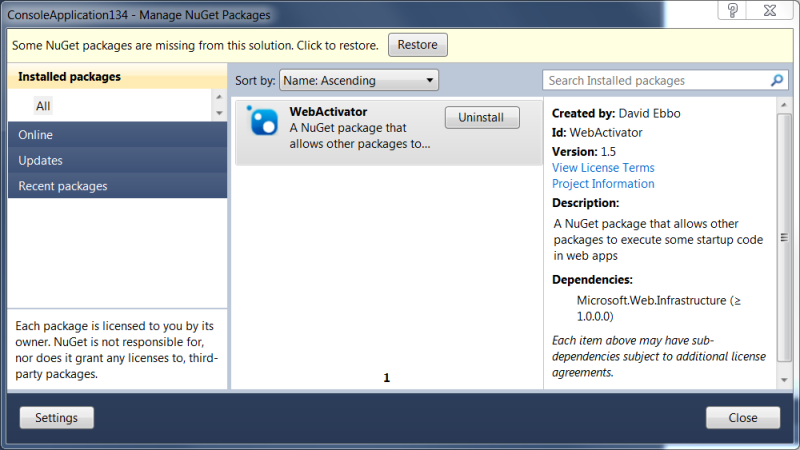 NuGet 1.7 has fixed many bugs around the Package Restore workflow and Network/Source Control scenarios. For a full list of work items fixed in NuGet 1.7, please view the NuGet Issue Tracker for this release.